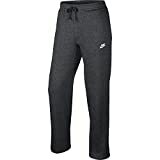 NIKE Sportswear Men's Open Hem Club Pants set you up with plush comfort without the bulk. Crafted with soft fleece fabric, they feature an updated, slim waistband and an open-hem design for a laid-back look. Interested in the NIKE Sportswear Men's Open Hem Club Pants, Charcoal Heather/White, Large? Is the price too high? You can easily price watch this product and we'll notify you when the price reaches your target.